The great outdoors provides a stimulating environment for children and young adults to learn some of life’s most valuable skills, such as teamwork, communication and trust. 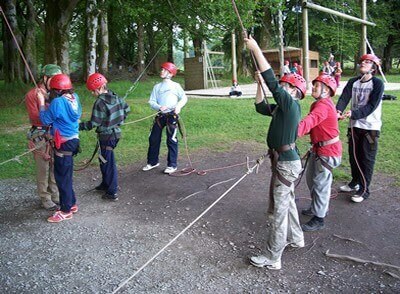 At our Adventure Activity Centre in Wicklow, we offer a range of challenging and exciting, team building activities which have been carefully designed to maximise the development of these skills – and ensure that your primary school or secondary school tour group has great fun in the process. Climbing & Abseiling – Pupils are challenged to climb on our 10m high climbing tower. Well established as one of the favourite outdoor pursuits. Leap of Faith – This is one they will be talking about for a long time afterwards! They climb up a wobbly pole and onto a small platform on the top. In front of them is a trapeze which is out of reach and they must jump through the air to catch it. A true test of faith! Balance Beams – These beams are high above the ground. They must climb up 4m and walk 10m along the pole to get to the other side. If they are feeling brave, they can then scale the supporting pole to get up the next level, another 4m up, and walk along that one too. The Vertical Challenge – This is a challenge in which they climb in pairs – and choose whether they support each other or compete! There is a mix of rope ladders, a short climbing wall, horizontal beams and ropes, etc. and participants will need to figure out the best strategy for progressing to the top. The Challenge Zone – This is our low ropes course, about 30-50cm off the ground; but don’t be fooled, this is hard work. Team work is essential to get around the course and when the participants succeed, they really appreciate what they have achieved as a team. Orienteering – We have a permanent orienteering course specifically designed for school groups right here on our 240 acre estate. The children figure out how to navigate around the course using maps and learn to manage their time limit effectively, all the while burning off any extra energy they may have left! School Trips at Kippure Estate, one of the most renowned outdoor adventure centres in Ireland, promise fully trained, experienced staff, top class facilities, a wide range of outdoor pursuits and a naturally beautiful environment which provides the perfect backdrop for an exhilarating day out of the classroom. We can tailor all activities according to the ages and size of your primary school or secondary school group. We continually research and update our programmes to ensure they are fully relevant to the syllabus and curriculum requirements of the Department of Education.